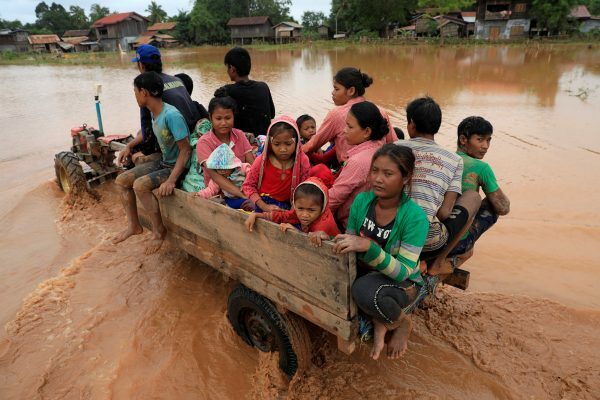 SANAMXAI, Laos—Troops searched for survivors in the remote southern tip of Laos on Thursday, three days after the collapse of a hydropower dam sent a torrent of water across paddy fields and through villages, as rescuers rushed aid to thousands of homeless. The scale of the disaster was still unclear, in part because of the inaccessibility of the area but also because reports from the communist country’s state media have been scant and sketchy. The official Laos News Agency said that about 26 people were confirmed dead and more than 130 were missing following the failure of the dam on Monday, a subsidiary structure under construction as part of a hydroelectric project. The Vientiane Times reported on Wednesday that more than 3,000 were awaiting rescue from swirling floodwaters. But on Thursday, the newspaper cited Prime Minister Thongloun Sisoulith as saying that only one person had been found dead and all those who sought shelter on trees and the rooftops of submerged houses had been plucked to safety. “His comment corrected misinformation carried by many media outlets that reported more deaths,” it said, adding that 3,060 had been made homeless by the disaster. A situation report from the U.N. Office for the Coordination of Humanitarian Affairs said roads and bridges were damaged and eight villages had been hit by flash flooding after the failure of the dam in the province of Attapeu. It said boat and helicopter were the only means of transport in the affected areas. Schools in safe areas were being used as evacuation centers, and about 1,300 families needed tents for shelter, it said. On the road to the small town of Sanamxai in the worst-hit area, Reuters saw Norwegian People’s Aid trucks carrying aid, including fresh water and blankets. Phra Ajan Thanakorn, a Buddhist monk returning from Sanamxai, said he had delivered food and medicine in four pick-up trucks that had come from Vientiane, the capital some 800 km (500 miles) to the north, and he was heading back there to load up with more. At a Sanamxai primary school, Reuters saw about 100 survivors from seven villages being tended to by Lao doctors, soldiers and police. A helicopter thundered overhead and landed in the grassy school compound, unloading about a dozen soldiers. Receding water levels have aided the search for survivors, which troops have been conducting on land and by boat, said a local official, who did not give his name. 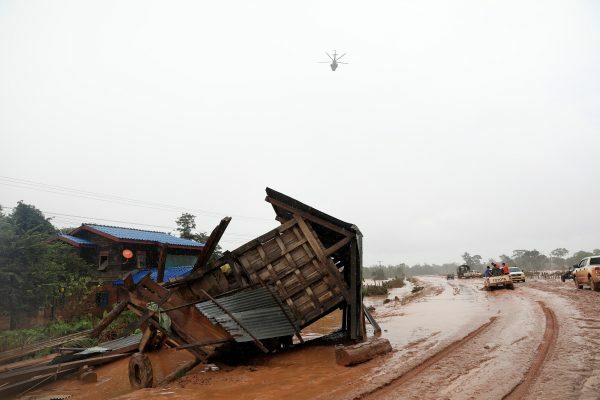 State media said on Wednesday that a team of Lao and Chinese rescuers was headed for Attapeu, a largely agricultural province that borders Vietnam to the east and Cambodia to the south. Laos, one of Asia’s poorest countries, has ambitions to become the “battery of Asia” through the construction of multiple dams. The firm blamed the collapse on heavy rain. 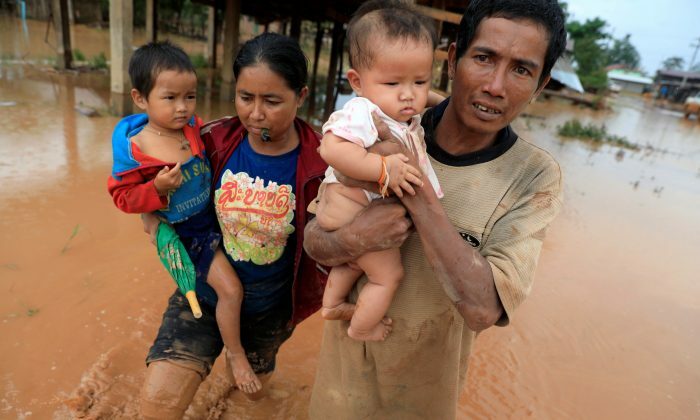 Laos and its neighbors are in the middle of the monsoon season that brings tropical storms and heavy rain. An official at SK Engineering & Construction said fractures were discovered on the dam on Sunday and the company ordered the evacuation of 12 villages as soon as the danger became clear.